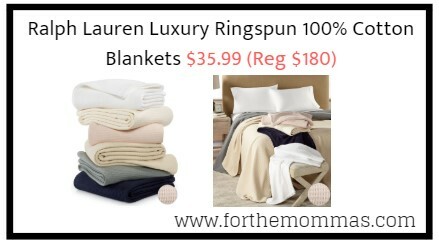 Macy’s has Ralph Lauren Luxury Ringspun 100% Cotton Blankets for $35.99 (Reg $180). You can get free shipping on orders over $75. Layer your bed with the long-lasting luxury of the Lauren Ralph Lauren Cotton blanket. Crafted from super-soft ringspun cotton, this durable medium-weight blanket sports a textured weave that complements any bed.